If the conservative view of the American race problem is frightening, the traditional liberal view seems impotent. Analyzing the race problem from neither right nor left, Brooks sheds a new and clarifying light on America's longest running social and moral dilemma. This incisive book provides a bold new examination of the seemingly intractable racial problems confronting Americans at the end of the twentieth century. In a wide-ranging and probing study, Brooks calls into question the prevailing wisdom about racism, civil rights legislation, and the composition of the Black community, going on to offer a dramatic new approach to the race problem. In Brooks' mind, civil rights laws—laws targeted at racial discrimination—have not only failed to engender racial equality, but have in fact had a negative effect on the standard of living of many Blacks. Brooks defines the American race problem so as to carefully separate racial oppression from (economic) class oppression and explains how civil rights legislation since the 1960s has hurt Black Americans of every class. He offers a strategy for resolving the country's racial inequities, unique in its attentiveness to class division in Black society, that combines governmental remedies and an unprecedented program of Black self-help. 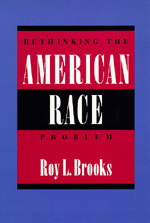 While Brooks argues that the government has the means to resolve the race dilemma, he suggests that it lacks the spirit to do so. Thus, it may be time for Black Americans to come to grips with an unpleasant reality—namely, that they can count on the government only for minimal alleviation, and must take on the larger portion of responsibility for resolving the American race problem themselves. Certain to arouse controversy, Rethinking the American Race Problem offers new understandings of issues often clouded by misconceptions and backward notions. It is an important book for anyone concerned about the current state of race relations in America. Roy L. Brooks is Professor of Law at the University of Minnesota School of Law. Flouting Civil Liberties: Libraries or Weapons?